I hope you’re enjoying your Spring Break. As you may have heard, there is a whooping cough outbreak in the greater LA area. Please check your records to make sure that your child has had a Tdap vaccine/booster. Also, be aware of the symptoms of whooping cough. If your child has symptoms, please contact your family doctor. The Detoy Award is given as meritedto an individual from the faculty, administration, and staff of Flintridge Prep for outstanding personal and professional contributions to the school. An employee with five years of service to the school is eligible. Awardeeswill receive $5,000 and be honored publicly. Any teacher, administrator, staff member, current parent, student or graduate may submit a nomination to the Awards Committee. The signed nomination should be at least one full paragraph explaining the unique qualities and contributions of the candidate. All nominations should be considered confidential. The Awards Committee consists of the Headmaster, the Dean of Faculty, the Dean of Studies and the Director of Finance. Awards Committee members may not submit nominations, nor are the committee members eligible for the award. In reaching a unanimous decision,thecommittee will review the credentials of all candidates to validate the data from the nomination and to consider additional factors including previous awards, previous nominations, testimonials and other appropriate qualitative and quantitative supporting data. The candidates’ contributions throughout their entire Flintridge career will be considered. Recent winners include: Nick Adams-Wright (2018) Joe Maggio (2017) Raj Wahi (2016), Madeline Barraclough (2015) and Mary Ellen Jamison (2014). Email your nomination to Peter Bachmann or deliver it to his office. If you have any questions, please call Margie Woolley at 818.949.5513. Campus will be closed Friday, April 19 and Monday, April 22 is a student holiday. There are several upcoming events for families, including those with new students. In addition, we realize that families like to plan ahead. Click here for a list of events for the remainder of the school year, as well as a basic calendar for next school year. Please refer to the school calendar often, as events do move around. Online registration is underway for the 2019 Summer Session. Find classes and activities for students in grades 5 through high school and register online today. We will be launching registration for our Parents and Alumni Summer Session in early April! Check the summer school button on the flintridgeprep.org homepage for dates and classes. All AP test takers will attend a mandatory pre-administration session in April, where they fill out their candidate packs and preliminary answer sheets to save time on test days. Each grade level will have an assigned day and will be receiving a link to sign up for a time slot between 2:40 and 4:00 pm on their designated day. Please contact Amanda Lem with any questions. Junior/Senior Prom will be Saturday, April 13 from 7:00-11:00 pm. Details, including location and theme, will be revealed after spring break. Each spring, the school hosts spring coffees. These short, lively and informative sessions are a great chance to come to campus and get a preview of the coming school year, meet other parents in next year’s class and hear from administrators. You will also receive a parent’s perspective on what to expect next year. Parents are asked to attend the coffee for the grades their children will be in next fall. You will receive more information about the coffees in April. On Wednesday, May 1, at 7:00 pm, seniors and parents are invited to Senior Celebration in Norris Auditorium. There will be a parent reception following the pinning ceremony in the library and a reception for seniors in the gym with a taco bar, DJ and photo booth. Seniors, come wearing your college colors! We warmly invite you to our annual Spring Music Concert on Friday, April 5, at 7:00 pm in Norris Auditorium. The concert will feature the Flintridge Singers, Advanced Vocal Ensemble, the Flintridge Prep Orchestra, and many soloists and duets. Tickets are free and available online at Flintridgeprep.org/fppa. Come join us for evening of springtime melodies and to honor our graduating seniors. The Prep DanceDepartment will present not one, but two performances of the springdance= concert, "See You Soon," on Friday, April 26 and Saturday, April 27. Two friends are leaving for college and pause to reminisce about their lives together before flying away on their new journey. The show is travel-themed, including dances about the subway, lost tourists, long distance relationships, rain and sunshine! Both shows start at 7:00 pm and admission is free. You can get tickets online at flintridgeprep.org/fppa. Spring sports have started with the preseason finished and league play is upon us. Despite its young roster, baseball is undefeated in league and currently ranked #7 in CIF. The golf team will contend for the league title with its strongest roster in a few years. Softball has a talented roster and will be in contention for a CIF berth. Girls and boys Swimming have sizeable rosters and depth to compete at the league and CIF level. Tennis has dropped only one league match and is ranked #8 in CIF. Track and field isstrong, as always, in distance, and is also benefitting from a youthful influx of talented athletes. Boys volleyball is undefeated in league and ranked #6 in CIF. Come out and support the Rebels! On March 9, ACL members spent the day at the Professional Child Development Associates facility hosting an Arts Fair where the children did welcome hand prints, superhero masks, spring paper butterflies and pasta necklaces. Each child was given a goody bag at the end of the activity. This initiative was led by the captains of the Initiative Committee; Libby Penn and Emily Alameddine, who also raised over $650 for PCDA. The Boys and Girls Club tutoring will end at the end of this month as the ACL prepares for its upcoming La Mascota 5K Run on April 6 and the 2019-20 ACL application process. Congratulations to Natalie Kaplanyan, Girls Water Polo, and Alex Payne, Boys Basketball, who were named ACL Athletes of the Month for the month of February. The ACL would like to invite everyone in the Prep community to be a part of the initiatives throughout the year. If you are interested in supporting or volunteering please contact Alex Rivera, Director of Athletic Initiatives, at (818) 949-5564. ACL news, events, updates and photos can be found here. Seniors, please carefully read the offer of admission from your college of choice and inform your college counselor of your outcomes. Counselors will begin to schedule meetings with seniors in April. Once a senior has decided on a college, it is imperative to pay the deposit on time (by May 1). You may only submit an enrollment deposit to one college; submitting a deposit to more than one institution is unethical and may jeopardize admission opportunities at both schools. Seniors who are wait-listed by their first-choice college must see their college counselor by April 15 to outline next steps. Juniors interested in attending the College Essay Writing Boot Camp on May 30 and 31 will receive a registration email shortly. Juniors and sophomores should register for Subject Tests in early May for the June sitting date. We strongly recommend all juniors register for either the April ACT or May SAT if they have not yet tested. Visit www.act.org or www.collegeboard.org to register. On Tuesday, April 23, at 7:00 pm, all juniors and their parentsare invited to attend the annual Case Studies Program at the Westridge School. Each parent will receive a copy of the program material by mail. Please bring the packet with you to the event. If you do not receive the mailing, please contact Amanda Lem (818) 949-5510. Save the date! On Monday, May 6, we welcome all parents, faculty and alumni to attend the annual Flintridge Prep Golf Tournament. This event is all about bringing together the Prep community. And what brings people together more than healthy competition and libations? Join us for a delicious lunch and a day on the links. Then stay for a while and discover your true handicap at our wine and bourbon tasting. There will be tasty bites and a lively silent auction. Can’t make it for golf? There will be special tickets just for the wine and bourbon tasting. Enjoy a heavy hors d’oeuvres and take in the stunning sunset at the beautiful La Canada Flintridge Country Club. It’s all for a great cause—the John Plumb ’64 Endowment Fund for Faculty Development. Stay tuned for an invitation. On Tuesday, April 23, join us for the New Dads Mixer. This mixer introduces new incoming dads to the Prep community and shares how the Fathers Club supports the school through volunteering efforts and initiatives. Stay tuned—an invitation is coming soon. A huge thank you to the entire Prep community for your support of Flintridge Flashback. We had a sold-out event, all silent auction items were sold and we had a record-breaking live auction. Not only were the costumes and enthusiasm at the Benefit awesome, but once again, the Prep community came together for a night of fun in true Rebel fashion. We will have an update in the coming weeks about the financial success of the event, with all proceeds going towards the Bachmann Collaboration Building. Last but not least, a big thank you to the benefit co-chairs Monique Stevens, Christine Lee and Sabena Sarma, their committee and the countless volunteers, faculty and staff who made this night a success. Reception in the library to follow Dr. Steinberg’s presentation. We encourage your student(s) grades 7-10 to invite their grandparents, aunts, uncles, and special friends. It is a day these special people in your children’s lives can come on campus, visit classrooms, see a performance from our recent musical, and dine on Prep’s fabulous cuisine. The continental breakfast begins at 9:30, and the day concludes at 1:00. There is no need to RSVP, but if you have questions, contact Special Events Coordinator Susanna Kwan at skwan@flintridgeprep.org or at 8180949-5522. This event has replaced the Spring Luncheon and is designed to be a fun evening for Prep Moms, current and new, to come together socially. Details to come. On Thursday, November 15, seven Prep students took the AMC 8 which is a nationwide competition for students in 8th grade and below. Bryce Kim ’23 score in the top 5% nationally, earning an Honor Roll Certificate and also first place in the school. Lucy Liu ’24 and Daniel Zhao ’24 tied for second place in the school and Maylin Chen ’24 earned third place in the school. 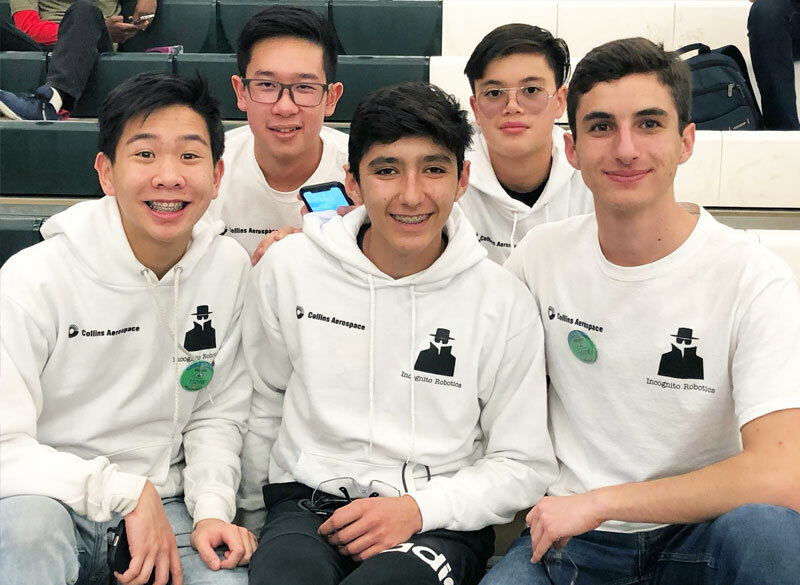 On Saturday, February 23, Flintridge Prep’s middle school math team took sixth place in the MathCounts Chapter Competition at Southern California Edison’s Energy Education Center in Irwindale. The team was composed of Maylin Chen ’24, Daniel Choi ’23, Lucy Liu ’24, and Daniel Zhao ’24. Maylin Chen ’24 also scored 18th place overall out of over 100 participants. Sydney Lau and Leon Kuo participated in the 13th annual Lit & Conference, a two-day conference hosted by the Archer School. The conference curates essays written by area students and assembles students into panels, where they discuss their works and take audience questions. Sydney’s panel was Society and Our Discontents, focusing on culture and social critique. The title of her paper was “America’s Overlooked Past: Genocide, Oppression, Racism, and Sexism in The Shining.” Leon was part of a panel called Me, Myself, and A.I., with an emphasis on artificial intelligence and the self. His paper was called “The World of AI: A Discussion of Literature, Humanity, and Culture.” Dr. Tyke O’Brien, chair of the English Department, was the moderator of a panel called Truth or Consequences, which focused on papers that explored the nature of truth. Prep’s Incognito Robotics team had a great showing in the First Tech Challenge (FTC) Regional Tournament. After going 3-2 in the qualifying matches against the strongest teams in Southern California, Incognito ended the season in the semifinals of the tournament.